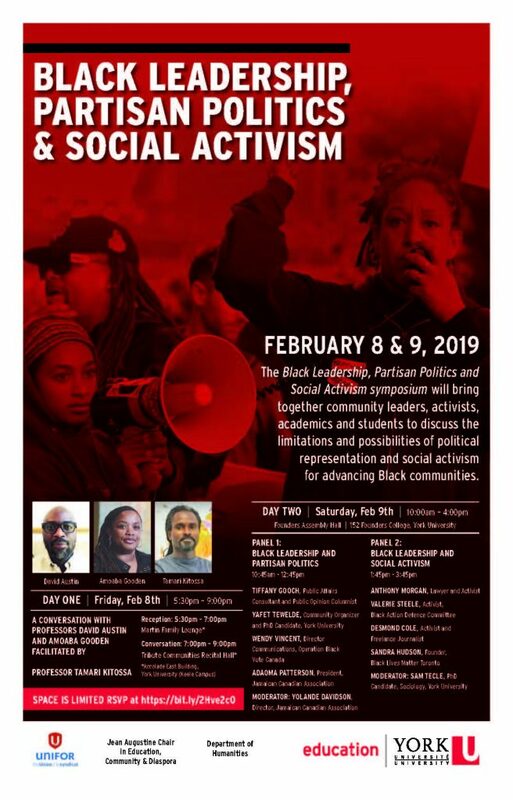 TORONTO, February 6, 2019 – The voices of some of Toronto’s most recognized Black Canadian leaders in politics and social activism will be heard at a two-day symposium celebrating Black History Month at York University on Friday, Feb. 8 and Saturday, Feb. 9, 2019. A two-symposium for Black History Month will be held on Friday, Feb. 8 and Saturday, Feb. 9, 2019. Desmond Cole – an activist, freelance journalist and former Toronto Star columnist – is working to bring attention to racial profiling and successfully advocated for the removal of a Toronto Police presence from schools in the Toronto District School Board. Anthony Morgan, a human rights and civil liberties lawyer and activist, has advocated on the issue of anti-Black racism in Canada at various levels of court, including the Supreme Court of Canada, and before two United Nations human rights committees in Geneva, Switzerland. Sandra Hudson, a community organizer and founder of Black Lives Matter Toronto, is an outspoken critic of anti-Black racism in policing who has demanded that police carding data be released and that the SIU be overhauled. They are among a dozen speakers at Black Leadership, Partisan Politics and Social Activism, a two-day event at York’s Keele campus, which will bring together community leaders, activists, academics and students to discuss the limitations and possibilities of political representation and social activism for advancing Black communities. Cole, Morgan, and Hudson are speaking on Day 2 of the symposium on Saturday, from 1:45 to 3:45 p.m. The event is organized by Faculty of Education Professor Carl James, who is the Jean Augustine Chair in Education, Community & Diaspora, a role which aims to advance access, equity and inclusivity to education through community engagement and collaborative action. While some may be critical of the tactics of some Black Canadian activists, James believes different voices, approaches and tactics are needed to help advance Black communities. When: Friday, Feb. 8 from 5:30 to 9 p.m.
What: Opening reception at 5:30 to 7 p.m. followed by a conversation from 7 to 9 p.m. about how Black leadership has evolved in relation to the social, economic and political conditions of Canadian society. This conversation will be with professors David Austin (John Abbott College, Montreal) and Amoaba Gooden (Kent State University, Ohio), facilitated by Professor Tamari Kitossa (Brock University, St. Catharines). When: Saturday, Feb. 9 from 10 a.m. to 4 p.m.
What: Two panels will feature invited community activists and organizers. Panel 1, on Black Leadership and Partisan Politics, 10:45 a.m. to 12:45 p.m. featuring: Tiffany Gooch (Public Affairs Consultant and Public Opinion Columnist), Yafet Tewelde (Community organizer and PhD Candidate, York University), Wendy Vincent (Director Communications, Operation Black Vote Canada), Adaoma Patterson (President, Jamaican Canadian Association), moderated by Yolande Davidson (Director, Jamaican Canadian Association). 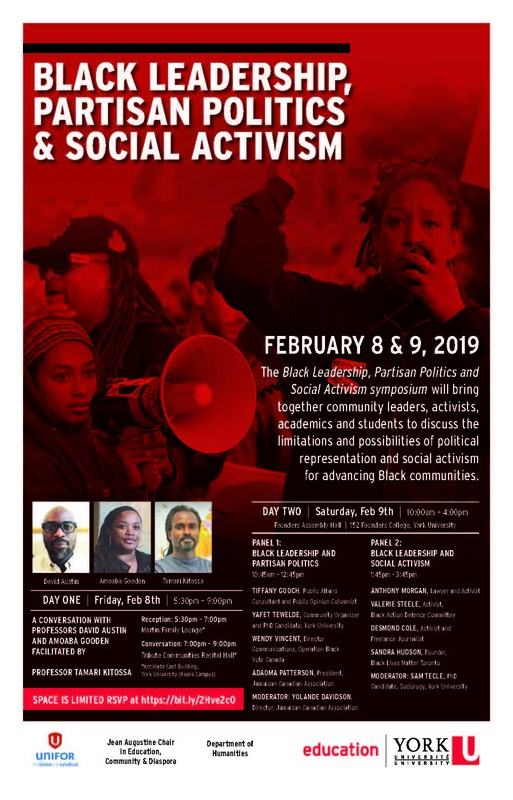 Panel 2, on Black Leadership and Social Activism, 1:45 to 3:45 p.m. featuring: Cole, Morgan and Hudson, along with Valerie Steele (Activist, Black Action Defence Committee), moderated by Sam Tecle (PhD candidate, Sociology, York University). NOTE: Space is limited for both days of the symposium so members of the public are required to RSVP. Members of the media should contact Media Relations (see below).